Transforming an extruder into a mixing vessel! How to archive this with the compounder having supreme ability to control the work carried out the time spent? Innovative and functional design improvements that provide real process solutions are the need of the hour. Modern high performance extruders are distinguished by their special features. Melting and Mixing are the two giant (meteoric) steps that take place inside the Extruder Processing Zone(EPZ) of a co-rotating twin-screw extruder. Enhancement of melting and mixing is the key to archive some extraordinary results. CONFIGURATION OF SCREW ELEMENTS IN EPZ! The adage ‘different stokes for different folks’ holds good when one attempts to deal with the EPZ of a Co-rotating Twin-Screw Extruder. Within this EPZ area the ‘key to success’ lies with the exact design of the ‘Element and Barrel’ Configuration. The earliest co-rotating twin-screw extruders had shallow flight depths and were designed to be run with a filled-uop hopper, in the same way an injection-molding machine or a single-screw extruder is run. When there are hundreds of different types and varieties of polymers, why use an additional process called Compounding? The answer is very simple. Most of us begin our day by using a compounded product. 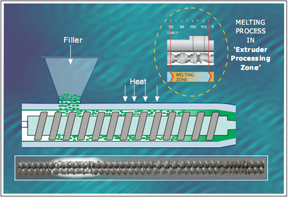 Co-rotating twin-screw extruders have evolved through the years. Deeper flights lead to increased efficiencies and reduced shear rates in a twin-screw extruder. This feature is advantageous in increasing the screw speed thereby maintaining mixing rates and increasing the volumetric capacity of the machine.